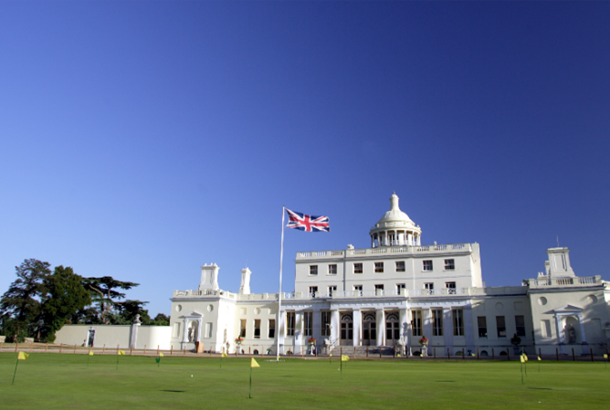 Iconic Buckinghamshire venue Stoke Park is investing a seven-figure sum in a facelift of its 27 holes, which were created by Harry Colt in 1908. The first phase of works has already started at the five AA Red Star country club, spa and hotel, involving rebuilding every bunker on the Colt course – holes one to nine – with some minor design changes being made to their shape and size before the holes reopen in April. The renowned strategic positioning of the bunkers will remain, however, with just a few minor tweaks. And, while the nine holes are ‘out of bounds’, other beautification work will take place to enhance one of the finest parkland golf experiences in the UK. The historic course played host to the PGA Matchplay in 1910 and, even more famously, the golf match between Sean Connery’s James Bond and Auric Goldfinger, in the 1964 film, Goldfinger. Director of Golf Stuart Collier explained: “We are very fortunate to have three nines of outstanding quality which enables us to close one for a brief period while maintaining 18 championship holes for members and visitors. The privileged task of reshaping the bunkers at the multi-award-winning venue will be undertaken by one of Europe’s leading golf course construction companies, Leicester-based John Greasley Limited, under the supervision of Collier and estate director Alex Millar. Each of the nine-hole loops will be addressed in turn, with the Alison (holes 10-18) being renovated in winter 2016/17 and the Lane Jackson (holes 19-27) the following year. Stoke Park chief executive Chester King added: “This significant investment is part of our ongoing commitment to maintaining Stoke Park as the ultimate members’ club and golf venue. We are hugely fortunate in having a beautiful and historic golf course, but like anything precious it occasionally needs some TLC and that is what we are looking to provide here. The bunker renovation is just the latest stage of the continuous investment Stoke Park is making. Recent developments include the addition of Trackman technology alongside the V1 Software in the state-of-the art swing studio, which has proved hugely popular at the Stoke Park Academy.